key in planned talks between the U.S.
WASHINGTON — President Trump and North Korean leader Kim Jong Un both say they have the same ambitious goal — denuclearization of the Korean peninsula — at their upcoming summit in Singapore. But the two leaders fundamentally disagree about what that looks like. The dispute over the shape, scope and speed of a potential disarmament has stymied international efforts to halt or roll back North Korea’s nuclear weapons program for three decades. It arguably poses the biggest obstacle to a successful summit now that the historic meeting is back on track for June 12. Reconciling or finessing that gap — and determining what the secretive police state would get in return for handing over or dismantling its devastating nuclear arsenal — could make the difference between a deal or no deal after the formal haggling starts. “The common mistake is to assume when the North Koreans talk about denuclearization of the Korean peninsula, they’re talking about giving up all their weapons,” said Victor Cha, who headed Asian affairs in the National Security Council under President George W. Bush and who took part in nuclear talks with North Korea at the time. “It’s not really the way we look at it, which is ‘Crate it up and take it out,’ ” said Cha, who now heads the Korea program at the nonpartisan Center for Strategic and International Studies. Rather, he said, North Koreans view denuclearization as a long-term aspiration, the way Americans talk of someday abolishing nuclear weapons from the globe. North Korea has a long list of other grievances, and could demand the removal of U.S. troops, or even the U.S. nuclear umbrella, from South Korea. Most experts say Pyongyang wants to be recognized as a full-fledged nuclear power with the weapons it has, but with global obligations, much as then-isolated communist China’s nuclear arms program ultimately was accepted after President Nixon’s historic visit to Beijing in 1972. The broad parameters of a potential pact are well-established: The U.S. side wants North Korea to give up the estimated 20 to 60 nuclear weapons that it has built, as well as the massive infrastructure that created them, and presumably the ballistic missiles that can hurl them across the Pacific. In exchange, Trump can offer U.S. security guarantees for the despotic regime in Pyongyang, in addition to better relations with Washington and its allies in Japan and South Korea, and easing of international economic sanctions that have strangled North Korea’s ability to trade with the outside world. Trump has signaled that he won’t offer a U.S. financial aid package, though he has suggested he would solicit Asian allies to do so. Whether that’s enough — or whether North Korea is really prepared to give up a vast weapons program that has consumed much of the impoverished country’s energy and resources for decades — remains to be seen. Many former U.S. negotiators with North Korea are deeply skeptical of how much its leaders will relinquish, and whether they would allow the intrusive inspections needed to ensure the program isn’t being secretly restarted — as North Korea has done in the past. 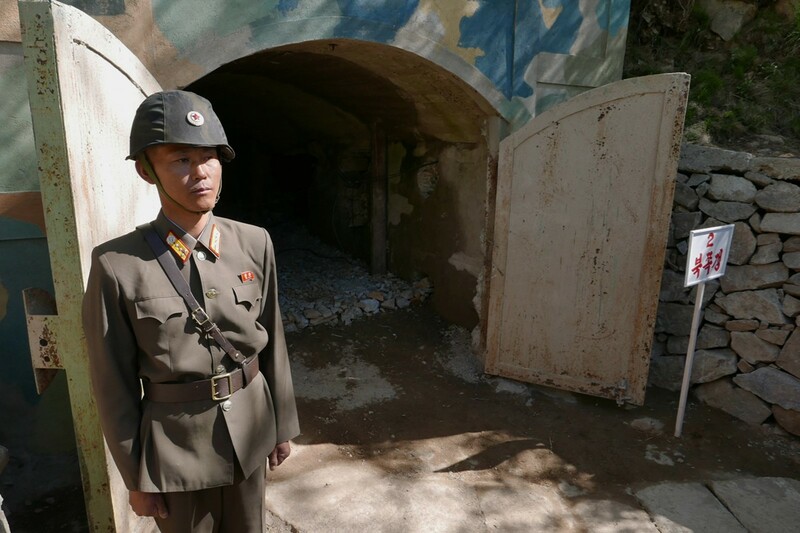 As part of the recent thaw, Pyongyang announced a halt to further nuclear tests — it previously conducted six — and last week blew up the entrances to its test site at Punggye-ri. It didn’t allow international inspectors in to determine whether the damage is reversible, however, and it could always lift its freeze. For now, the two sides have yet to define denuclearization, a strategic ambiguity that could provide negotiating room or doom the diplomacy altogether. The end goal for the Trump administration is what it calls “complete, verifiable and irreversible denuclearization,” jargon now so common it’s referred to as CVID. In theory, that would require robust inspections and long-term monitoring of hundreds of North Korean military sites and buildings, most now secret, in a verification program far more intrusive than the 2015 nuclear accord that Trump recently abandoned with Iran. One of Trump’s chief complaints was the Iran deal focused only on its nuclear program, not its ballistic missiles or support for terrorist groups. In the case of North Korea, the administration has not made clear if it will seek curbs on Pyongyang’s ballistic missiles — or its extensive chemical, biological and cyber warfare capabilities, demands that would complicate a potential pact. Behind the scenes, U.S. officials have sought to narrow their differences with Pyongyang in a rush of advance planning and talks in Washington, New York, Singapore and in the buffer zone that divides the two Koreas. Trump’s national security advisor, John Bolton, enraged North Koreans and nearly scuttled the sensitive diplomacy when he suggested North Korea should follow the “Libya model.” Libya gave up its nascent nuclear program in 2003 in hopes, largely disappointed, of economic benefits. Its leader, Moammar Kadafi, was brutally killed during an uprising eight years later. Most nuclear experts discount the idea of an immediate and complete denuclearization in North Korea given its vast program and deep distrust of Washington. They say full disarmament probably would require at least a decade, time that would allow the two governments to build trust as they see results. “The summit represents a historic opportunity,” said Siegfried Hecker, a former director of the Los Alamos National Laboratory and one of the few Americans who has toured North Korea’s major nuclear facilities. But he said Washington “will have to settle for a phased process,” not a quick disarmament. Hecker and two coauthors, Robert Carlin and Elliot Serbin, recently completed a study at Stanford University that argues full disarmament would take 15 years. After a halt in nuclear weapons and missile tests, they argue, initial stages would include ending production of plutonium and highly enriched uranium, either of which can power a bomb, and stopping exports of nuclear technology or expertise to other states. Kim wants multilateral security guarantees, in particular a declaration from the United States that it won’t seek to overthrow his government, said William Overholt, a senior research fellow at Harvard University. The isolated nation also probably wants cultural and economic exchanges — and eventually some form of diplomatic recognition, he said. “Both sides quite reasonably don’t trust the other, and it has to be a very permanent agreement that it’s hard for us to back out of,” Overholt said. The U.S. side also has a list of demands, although it’s far from clear how much it will get. “I think what the U.S. will settle for is at least a big down payment upfront, where North Korea dismantles something, gives up something, blows up something, or ships out ICBMs,” said Sue Mi Terry, a Korea expert, referring to the country’s intercontinental ballistic missiles. Terry, a former CIA officer who worked in the White House under Bush, said that could be followed by a more phased approach, like those attempted in past negotiations. The most ambitious were the so-called six-party talks in Beijing after North Korea pulled out of the Nuclear Nonproliferation Treaty in 2003, raising concerns around the globe. After five rounds of negotiations, North Korea pulled out of the talks in 2009 and expelled all international nuclear inspectors. The Trump-Kim summit is complicated by the competing interests of other major Asian nations, notably China, South Korea and Japan. Japan and South Korea both depend on U.S. guarantees of a nuclear response, if needed, if they are attacked. Any move to rescind that promise or withdraw U.S. troops could upset the alliances and lead to a regional nuclear arms race. China, North Korea’s major trading partner and closest ally, worries that Washington could gain an upper hand in a region where Beijing has exerted growing influence. Beijing also worries about the unlikely prospect that a future unified Korea could align itself with Washington. Trump has made clear he is suspicious of China’s motives, even as he has lauded President Xi Jinping for enforcing tighter sanctions on North Korea. Trump also has praised South Korea’s president, Moon Jae-in, and Japanese Prime Minister Shinzo Abe, although he blindsided both when he initially agreed to the summit in March, and again when he said on May 24 that he was pulling out. On Friday, Trump said the summit was back on again. Moon has played perhaps the most crucial role in the rapprochement between Kim and Trump, acting as a middleman at crucial stages. Moon and Kim have met twice, including surprise talks last weekend that helped calm nerves in Washington and Pyongyang after testy public exchanges, and spurred diplomats to redouble their efforts. Moon, like Trump and Kim, has spoken enthusiastically about “complete denuclearization” of the peninsula. But his definition is the most malleable. He is more concerned with improving relations with North Korea, including a possible peace treaty to end the Korean War that sputtered to a cease-fire in 1953, but never technically ended. Moon suggested to reporters recently that he would leave it to Kim and Trump to define denuclearization. Cho Myoung-gyon, Moon’s minister in charge of inter-Korean affairs, called the gulf “huge,” but expressed optimism. Special correspondent Stiles reported from Seoul.